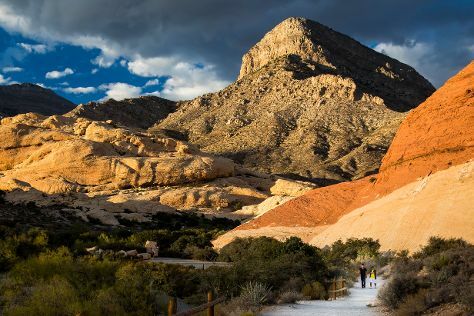 Kick off your visit on the 4th (Sun): take in breathtaking views at Red Rock Canyon National Conservation Area. For maps, other places to visit, more things to do, and more tourist information, you can read our Las Vegas sightseeing planning site . Washington DC to Las Vegas is an approximately 7-hour flight. You can also drive; or do a combination of train and bus. Traveling from Washington DC to Las Vegas, you'll gain 3 hours due to the time zone difference. Prepare for a bit warmer weather when traveling from Washington DC in August: high temperatures in Las Vegas hover around 101°F and lows are around 77°F. Cap off your sightseeing on the 4th (Sun) early enough to go by car to Zion National Park. Angel's Landing has been added to your itinerary. Kick off your visit on the 5th (Mon): trek along Angel's Landing. Get ready for a full day of sightseeing on the 6th (Tue): trek along The Narrows. To see other places to visit, where to stay, reviews, and more tourist information, refer to the Zion National Park trip tool . You can drive from Las Vegas to Zion National Park in 3 hours. Alternatively, you can do a combination of flight and taxi; or do a combination of flight and car. The time zone changes from Pacific Standard Time to Mountain Standard Time, which is usually a 1 hour difference. Traveling from Las Vegas in August, expect nights in Zion National Park to be colder, around 54°F, while days are slightly colder, around 90°F. Finish your sightseeing early on the 6th (Tue) to allow enough time to drive to Bryce Canyon National Park. On the 7th (Wed), explore the wealth of natural beauty at Peek-A-Boo Loop. For other places to visit, traveler tips, ratings, and tourist information, you can read our Bryce Canyon National Park trip itinerary maker website . Drive from Zion National Park to Bryce Canyon National Park in 3 hours. Traveling from Zion National Park in August, expect Bryce Canyon National Park to be little chillier, temps between 77°F and 46°F. Wrap up your sightseeing on the 7th (Wed) to allow time to drive to Capitol Reef National Park. Kick off your visit on the 8th (Thu): explore the wealth of natural beauty at Capitol Reef National Park . For more things to do, other places to visit, reviews, and more tourist information, go to the Capitol Reef National Park tour planner. Traveling by car from Bryce Canyon National Park to Capitol Reef National Park takes 3.5 hours. In August, daytime highs in Capitol Reef National Park are 77°F, while nighttime lows are 46°F. Finish your sightseeing early on the 8th (Thu) so you can drive to Canyonlands National Park. Start off your visit on the 9th (Fri): take some stellar pictures from Grand View Point Overlook, explore the striking landscape at Mesa Arch, then take in the dramatic natural features at Island in the Sky, and finally stroll through Murphy Point Trail. For where to stay, other places to visit, more things to do, and other tourist information, use the Canyonlands National Park visit planner . You can drive from Capitol Reef National Park to Canyonlands National Park in 4 hours. Traveling from Capitol Reef National Park in August, things will get a bit warmer in Canyonlands National Park: highs are around 92°F and lows about 63°F. Wrap up your sightseeing on the 9th (Fri) early enough to drive to Arches National Park. On the 10th (Sat), explore the striking landscape at Fiery Furnace, explore the striking landscape at Delicate Arch, then trek along Turret Arch, then hike along Double Arch, and finally tour the pleasant surroundings at Double Arch. To find ratings, reviews, other places to visit, and more tourist information, use the Arches National Park sightseeing planning app . Traveling by car from Canyonlands National Park to Arches National Park takes 2 hours. In August, daily temperatures in Arches National Park can reach 92°F, while at night they dip to 63°F. Finish up your sightseeing early on the 10th (Sat) so you can travel to Salt Lake City. Inspirock's itinerary builder makes planning a Salt Lake City trip simple and quick. Getting from Arches National Park to Salt Lake City by combination of car and flight takes about 5 hours. Other options: drive; or do a combination of car and train. In August, daily temperatures in Salt Lake City can reach 92°F, while at night they dip to 67°F. On the 11th (Sun), you'll travel back home.